It’s not always easy being a toddler and from time to time life can become too much for even the best of them. When it does, the angelic façade is cast aside and a sudden, theatrical outburst can be sparked by the slightest provocation. Worse still, temper tantrums can take place anywhere at any time, causing parents to feel embarrassed, inadequate and unable to cope. Many stay-at-home dads dread the terrible twos, but temper tantrums can start when a child reaches nine months and, although the pique peak is at around two years, tantrums can continue until a child is three years or older. 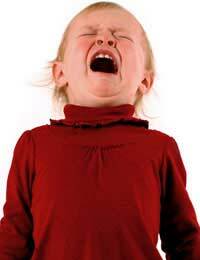 Remember that toddlers do not have the exclusive rights to temper tantrums. Older children, teenagers and even adults throw tantrums, but grown-ups are better equipped to deal with these difficult situations. Toddler tantrums can be triggered by the child being denied something he wants, rebelling against authority, feeling bored, becoming frustrated by his limited skills, resenting unfair treatment, feeling ignored, failing to communicate what he wants or resenting other children infringing on his territory. While tiredness, hunger or illness can act as the catalyst for a tantrum, it is rare for any of these being the sole cause. There is no one solution that will put an end to all toddler temper tantrums. When it comes to dealing with a tantrum, a lot depends on what triggered it in the first place. For instance, if a toddler feels ignored, he may have a tantrum to seek attention. In this case, the best policy is to ignore the behaviour, thereby demonstrating to the child that a tantrum is not the way to get attention. Initially, the toddler may become even more irate, but once he realises the tantrum is not having the desired effect he will switch tactics. Do not tell the toddler to behave and stop screaming, or point out that people are staring and that it is embarrassing, as he will thrive on this attention, even though it is negative. It is better to leave the room – if possible – and deny the child an audience. If, however, a child throws a shape sorter across the room and starts screaming, he is probably frustrated by his inability to solve the puzzle. In this case, be firm and explain that the behaviour is not acceptable and then help him to complete the task he was attempting. When a child is frustrated by his limited skills or by his failure to communicate, a supportive househusband can show him that he can succeed with a little patience and perseverance. When a toddler throws a tantrum when caught disobeying sensible rules laid down by his parents, the only solution is to take him to his room and give him time to calm down. For example, if a toddler is playing on the stairs or trying to climb the fire guard, he may hurt himself, so it is important for parents to be firm and explain to the toddler the potential consequences of his actions. It is not easy for all toddlers to calm down by themselves, so be willing to read a book or play a game until order is restored.